Construction on the wooden pyramid that would hold the light didn’t start until March 1889, but the light was shining by September that same year. 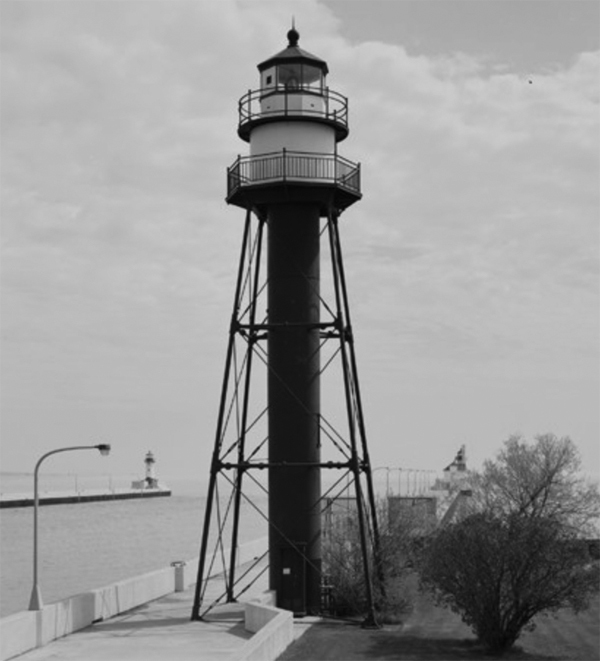 Like the South Breakwater Light, the beacon boasted a red fourth order Fresnel lens, but instead of a continuous beam, it flashed a signal every six seconds. It wasn’t foolproof: just sixteen days after the light commenced flashing, the steamer India collided with the pier at the base of the light itself, damaging the foundation. As with the old South Breakwater Light, the first Rear Range Light came down during the pier’s reconstruction. 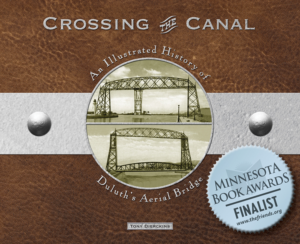 By then, electricity had arrived in Duluth, which brought more lights along the shore; mariners complained they had difficulty differentiating the guiding lights from others. The new light would have to be much different than its predecessor. And it was. Engineers replaced the wooden pyramid with a seventy-foot-tall steel tower eight feet in diameter. Built in 1902, the tower is supported by four tube-like legs bolstered with struts and tension rods. The gallery at its top holds an octagonal cast-iron lantern that houses the lens. Workers painted the watch room black and the rest of the tower bright white, providing a striking visual contrast that allowed mariners to use it as a navigation device even in daylight. Engineers also relocated the light, placing it roughly in the middle of the pier instead of at the westernmost end. In 1995 the old Fresnel lens retired to the Lake Superior Maritime Visitor Center; a new acrylic optic light took its place. And the tower has a slightly different look than when first lit: at some point painters reversed the black-and-white scheme. In 2008 the Coast Guard sold the rear Range Light to Duluthians Steve Sola and Matt Kampf.